The Ski- and Board Arena Werfenweng is a medium sized ski area guaranteed to have snow with 30km of runs, 2 gondolas, 2 chairlifts, and 5 rope tows. One of the gondolas starts directly from the village center, a five minutes’ walk from the Deublerheim. The ski area is both suitable for beginners as well as challenging for the experienced. 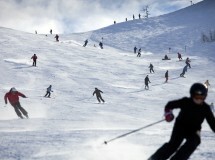 There are also various options for off-piste skiing. The Zaglau Arena is perfectly suited to the beginning skier and boarder. Guests at the Deublerheim who would like to buy a multi day ski pass can receive a sizeable discount.